‎"If a cluttered desk is a sign of a cluttered mind, of what, then, is an empty desk a sign?" -Albert Einstein Don't be ashamed of your messy beading area! Show us what your work area looks like, and let's talk about organization and the creative process. Want to be Featured on This Blog? Yes, that's one of my favorite Bead On It Boards, in the middle of a beading project. Note the tidy arrangement of my seed beads and accent beads, making it easy to find each bead as I need it. Again, note the precise placement of each type of bead in a manner that makes it easy to find as I'm stitching. Now, I used to use those little ceramic paint dishes for my beads as I worked, but you know what? I didn't really like them. They were cold, they weren't comfortable for beading on the couch or in bed, and yeah, if you dropped one, you had to pick up both all those seed beads plus the shattered pieces of ceramic. Back in November (or was it October? ), I bought a couple of bead kits from The Jade Dog to participate in her challenge contest. Sure, I told myself, I have LOTS of time to complete two new pieces for the competition before December 1. This is as far as I got as of the morning of December 1, and even with everything else that I have going and the zillion other projects I'm working on, I feel compelled to finish this piece. My goal now is to finish it before Christmas. We'll see. But back to the messy bead tray. There's something that's almost liberating about being able to toss my beads into little piles like that and just let them roll where they may. It inspires me to new color combinations and new ideas for mixing textures. Of course, when the project is actually finished, there's always cleanup... Which is how bead soup was invented, I suspect. Depending on my mood, I'll sit there with my slender, narrow, metal bead scoop and separate each type of bead and put them back into their original containers. Or, if I'm in a hurry to start my next project, I'll just scoop 'em all up and stuff 'em in a little plastic baggie. Which explains why I've got dozens of little plastic baggies of mixed-up beads in my bead stash. 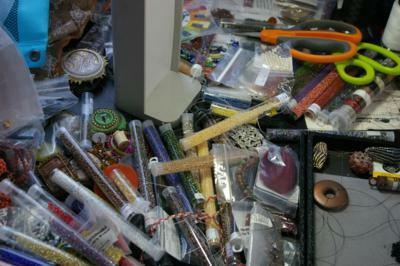 Do your beading trays look like they are just one step above controlled chaos while you work? Oh I gotta say you sure gave me a chuckle. This is my beading tray, room, & life. All over the place, but hey I'm happy.